I didn’t see this coming. Yes, winter 2011-2012 has been quite unusual and it is becoming more obvious that almost anything can happen with our weather these days (see October snowstorm followed by days in winter 2012 when my house windows were opened). But, a moderate to severe drought just seven months after many of us were wondering if the rainstorms were going to stop? With the insight that my co-authors and I had looking over the past 500 years of drought history for the Greater NYC region, I didn’t expect this. 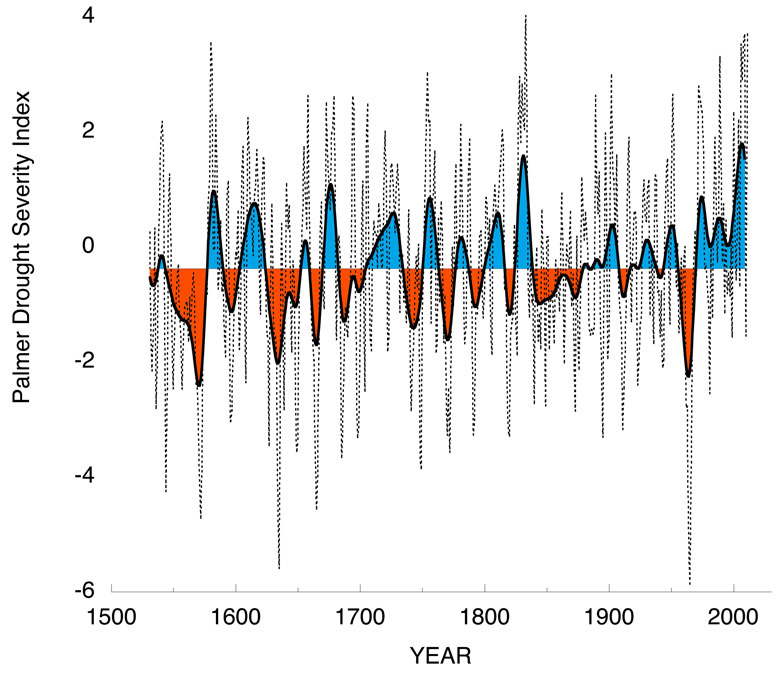 In a paper currently in revision with the Journal of Climate [update: now published, here and a PDF is here], we reconstructed drought history using tree rings back to the year 1531. We were wrapping up the manuscript in Summer 2011 when the march of the tropical storms was beginning. To talk about the drought reconstruction for a hike I was leading on Columbia’s Lamont-Doherty campus, I put together a record of the Palmer Drought Severity Index derived from meteorological measurements. When I first calculated annual and summer drought for the past 110 years, I thought I or the web source used to gather the data made a mistake because it looked odd, unnatural even. It looked like The Hockey Stick, but for moisture, not temperature. I immediately showed the figure to co-authors and a few more folks in the lab. I cannot quote everything that was said; this blog is rated PG, I assume. Some things that can be quoted are, “Wow!”, “Bizarre…”, “Are you sure that is correct?” No, I wasn’t sure that it was correct. The online data source was fairly new, so it was conceivable that there was a bug in the program. So, I contacted other sources and acquired data elsewhere. The results were the same. The instrumental record indicated that the last decade had been extremely unusual. And, as the tropical storms marched up the eastern US, 2011 was only continuing that trend. This ‘discovery’ was exciting in and of itself. It was so exciting, I squeezed it into the manuscript. But, looking at the series again was encouraging in a sense: I made three different attempts at reconstructing drought history for the NYC region prior to finalizing the manuscript, experiments if you will, and each indicated that the end of the 20th century appeared unusually wet. The indication from measured data that the end of the 20th century supported what the trees were saying. 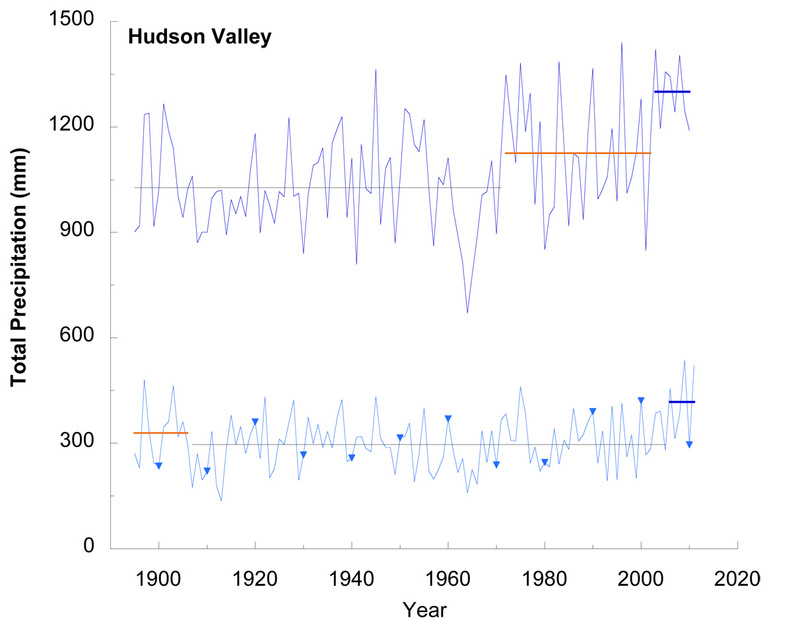 The first drought reconstruction for the Hudson Valley, in 1977 (and the last tree-ring reconstruction specifically targeted for the larger Hudson Valley), showed for the first time that one could reconstruct drought in the humid eastern US. This was an advance because, well, it wasn’t too obvious at the time that trees that generally receive ~3.5 inches of rain each month (89 mm) would be sensitive to changes in moisture, at least, not compared with a semi-arid region like that of the Southwestern US. A collection of four different species for the first reconstruction nicely captured the variation of July drought from instrumental record. With Ed Cook as a collaborator, we now had 30+ tree ring records composed of at least a dozen species distributed across the valley. Most importantly, some of these records now stretch back to the 1400s. The original reconstruction most reliably went back to only 1700. Interestingly, the original reconstruction ended just prior to the phenomenon that I had trouble believing was real in my first attempt at reconstructing drought for the NYC region. Reconstructing drought for the NYC region was not something I planned to do with my dissertation data. But, after the results of a paper by Ed Cook using a chunk of this data and then some interesting work with some of this data by a group of Manhattan College students for a group project, I was inspired in 2007 to see how my collection of tree ring records across the Hudson Valley would perform in a drought reconstruction. It was exciting to test my dissertation data from the Hudson Valley for a new drought reconstruction because it was diverse and spatially dense. What made the new tree-ring network derived from my dissertation most outstanding was the number of species used. A handful of new studies suggest that species replication might improve tree-ring based reconstructions (see here, here, and here). The new data set would be a good test of this hypothesis. 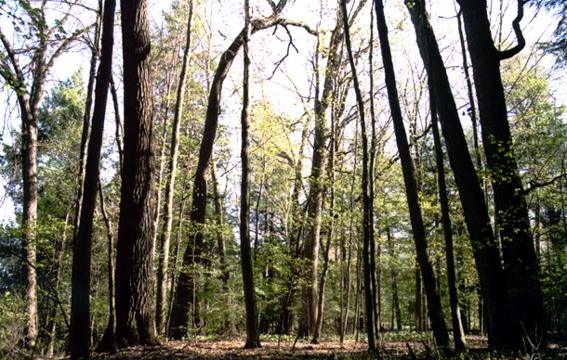 Results do support the idea that species replication aids tree-ring based reconstructions. More work needs to be conducted in this arena, but the results are promising. So, we can now take drought history reliably back to the early-1500s. The new network reconstructs a longer season of drought, May-August, and accounts for more of the year-to-year change in moisture conditions from the instrumental record than the original reconstruction; I suspect the species diversity used here helps capture a broader window of drought. The new reconstruction reveals droughts in the past that make The 1960s Drought seem like a bad cough. For example, there were 23 straight years of below average moisture conditions in the 1500s. And, this drought falls only one year after a 5-yr drought and 10 years after an intense drought that began in 1543. If drought conditions only somewhat similar to the 1500s return, the NYC region will be in a heap of trouble. Annual May-Aug drought (dashed line) for the Greater NYC Region. The solid line emphasizes decadal-scale changes in moisture availability including pluvials (above average moisture; blue) and drought (red). For myself, this finding of increasingly moist conditions in our region puts a different perspective on events and phenomena, especially given simulation modeling suggesting that this region is expected to continue to get wetter in the future. The beach closings because of sewage treatment overflow of last summer or the frustration of upstate residents because of reservoir water levels and stream quality? 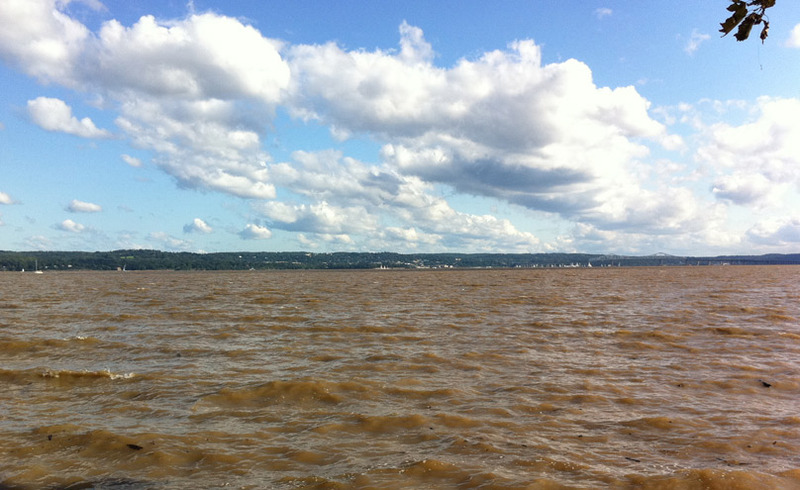 2011 might be a signal that we will have to take on the issue of too much water so that we can swim in the summer. An acquaintance’s yard and basement is staying wet these days. They had the local government look for leaks in village’s water pipes. What if rising groundwater is causing this issue? What will the homeowner’s solution be? Someone asked me why trees on the edge of a local wetland were dying. My moisture-colored glasses can only think, again, of a rising water table playing a role (certainly it is more complex than this, correct?). So, because of this long-term trend, I didn’t expect this year’s drought, despite the fact that I have been telling folks that the droughts of the past could come back and haunt us. We cannot predict just yet how the rest of this year, next 2-3 years, or decade will play out. Richard Seager has tried to determine what drives precipitation in this region. Turns out it is pretty difficult to understand with our current set of scientific tools. But, if this drought becomes more severe and extends itself for another 3-5 years, it will push those of us living in this region to think hard (again) about our water use during these wet years. This entry was posted in climate, water, weather and tagged drought, dry, Ed Cook, history, Hudson River, Hudson Valley, index, measurement, Neil Pederson, New York City, rain, Richard Seager, tree, tree ring, water, wet. Bookmark the permalink. Fantastic post.. and very thought-provoking!